This doesn’t want to be Orioles related. It struggles to be, like seaweed on the ankle of a surfer, or a spider web you didn’t happen to see when you walked through a doorway. In fact, I debated for a long time over whether or not to write about this subject, mainly because I wasn’t sure if there was a relationship between the umpiring in Major League Baseball and the Baltimore Orioles. But, the more you look into it, not so surprisingly, the conspiracy theories seem to dissipate, leaving a very real idea in Baltimore fans’ heads that umpiring is, in fact, not just humanistic, but subject to real life bias. The issues, if that’s what you want to call them, stem back to the recent series with the Boston Red Sox. Let’s just assume we all saw it. And if you haven’t seen what’s been happening, then let’s give you a link to YouTube. Or www.mlb.com. Either of those should help you out. Last night, umpire Sam Holbrook, took it into his own hands to kick Kevin Gausman out of the game after Gausman plunked Andrew Bogaerts with a 77mph slider to the backside. Bigger heads, not circumstances, should have prevailed. However, later in the game, it became quite obvious that Holbrook had it out for the Orioles when he ejected Adam Jones for displaying disagreement over whether an obvious outside pitch was actually the strike three that Holbrook claimed it had been. And here we stand, where the human aspect of umpiring resides. Baseball uses the excuse that it won’t replace the creatural ideals that man the bases because it relieves the sport of the mechanical right and wrong to which so many sports have adapted. And, with that statement, it’s easy to see why so many baseball enthusiasts jump on board, arguing that baseball is the classic sport which places itself as the essence of human error as utmost athletic godliness. However, with those human characteristics that are involved with balls or strikes, safe or out, fair or foul, baseball then takes on the responsibility of human emotion. It isn’t something that is taken into account much by the traditionalists, who believe the fallible elements have existence within balls and strikes but not beyond to the complicated aspects of emotional reasoning involved in controlling the ebbs and flows of the game . But it is something of which to be aware. Baseball is not hockey. It is not football. It is not even professional basketball. It is a technical sport. It is a sport that lacks a lot of physical contact, but instead makes up for it all by intricacies, the stats, the pieces that make it so hard to explain to your children. And while the abstruse aspect creates an enveloping aurora of love that is hard to match, the obsession with human error has come back to haunt the league when it comes to the growth of emotion in series such as the one between Baltimore/Boston. There needs to be a medium. Most of us who read these types of blogs understand that our love of baseball has its roots in the idea that this sport is the only one left with a human element. But, unfortunately, as we’ve been witness to, the emotion that gets dragged from divisional series, when teams and players see each other 21 times a season, affects not only the players’ heads but the men who are supposedly in charge of keeping order and calling it down the middle. There is no reason to believe that Sam Holbrook did not mean well when he tossed Gausman and turned his back to Caleb Joseph and Buck Showalter. He was doing what any person would do who found himself in a situation that he did not find to be comfortable. Like anybody on the face of the Earth, Holbrook acted on raw emotion, attempting to suit everybody by acting immediately and determining what needed to be done without question. Unfortunately, he was wrong, as so many umpires are when they are held to the standards of snap-fast reaction. The Orioles found themselves in the wrong place at the wrong time, and so we find ourselves in a precarious situation. 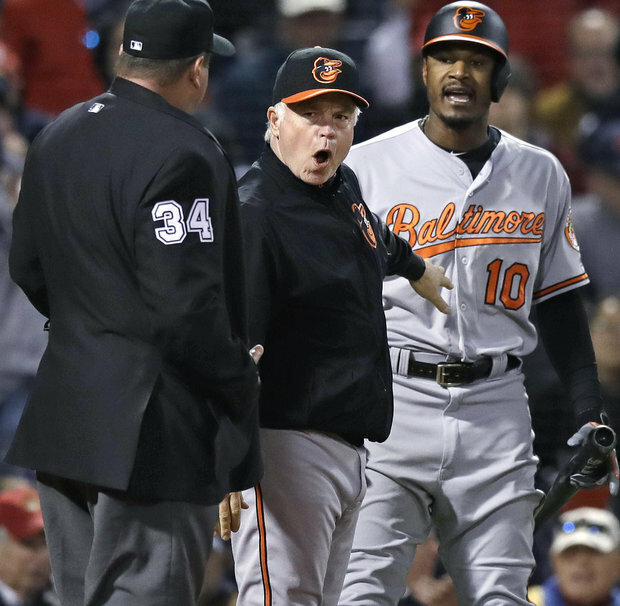 The escalated altercations between the Orioles and the Red Sox led to the problems both between the players and the umpiring. Major League Baseball, as well as management, had a responsibility to step in and defuse what had grown to be an explosive problem. They failed. And, as fans, we witnessed what would become a lesson in how the ripple effect of controversy has a solid hand on all aspects of the game, umpiring included. The problem now lies in the reactions of those who determine the outcomes of the game. not the men who are actually playing. Because, as we have seen, despite any on-field wrangles between the Sox and O’s, the umps became the most emotionally diluted team to change the outcome of the series.